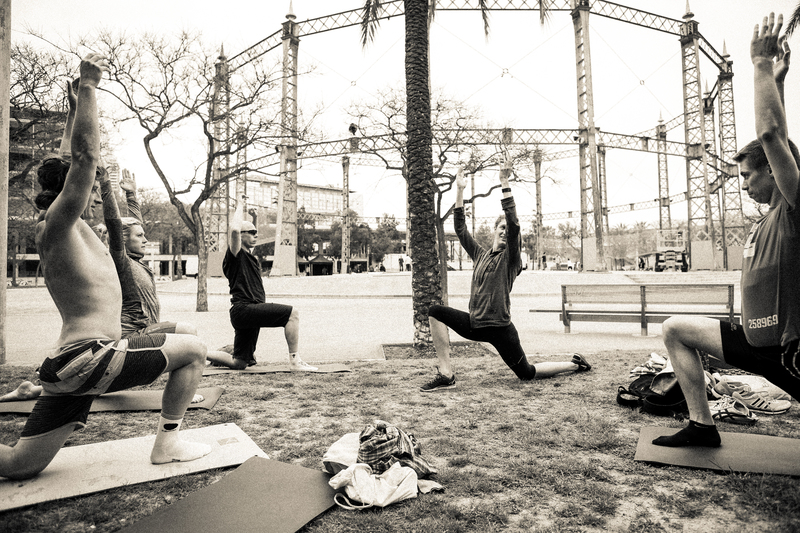 Start or end your days in Barcelona with a run or workout outdoors in this lovely city! Take the opportunity to see something else than the congress area and the tourist spots, I’ll show you hidden secrets while you get a chance to relax your mind. For Saturday & Sunday morning runs we meet at 8:00 / 8AM at Plaza de la Catedral and we’ll do aprox 10km. Forget about maps, gps and getting lost, I’ll show you the way so you can focus on running and enjoying the beautiful surroundings. If you want to run or do a full-body workout or bootcamp at another time let me know and I’ll arrange it! Training sessions created for you based on your goals, your body and your possibilities. Generic programs do not fit all! Maximise your time; the sessions are held according to your schedule and not the other way around, you decide day and time! Also, you won’t have to think or plan what to train and which exercise, nor coming to the gym not knowing what to do. With me you just have to show up as agreed, I’ll take care of the rest. Avoid hitting the plateau. Same workouts will help you maintain your fitness level but after a while you won´t make any strength or muscle gains. Why only (up to) 6 people in the groups? I have decided to put a limit of maximum 6 participants per small group session because I want to keep it personal and be able to give the best personal attention to everyone that’s attending. You’ll be able to learn proper technique and form which will make your training safer (avoid injuries) and more efficient (=better and faster results!). Keeping it small also allows me to truly adapt the exercises and intensity to each individual (once again =better and faster results!). Especially proper form is really important to me and I am not one of those trainers that will sacrifice form for more reps or exercises with a higher difficulty before you’re prepared for it. Stretching session with Envol Cycling from Sweden. Conference activity: Try a workout for your next conference. The workout can act as an icebreaker as well as team building activity. Scheduled workouts during working hours: the employees get a break to de-stress, release tension while improving their physique and obtain energy for the rest of the day. Scheduled, but optional workouts before or after work or conferences: As the employee you take the initiative to promote the activities to your employees, but they decide themselves if they wish to attend or not. Office workout: I’ll show your employees how to build and maintain core strength as well as stretching at the office in order to keep a good posture and avoid lower back, shoulder and neck pain and other common “office injuries”. 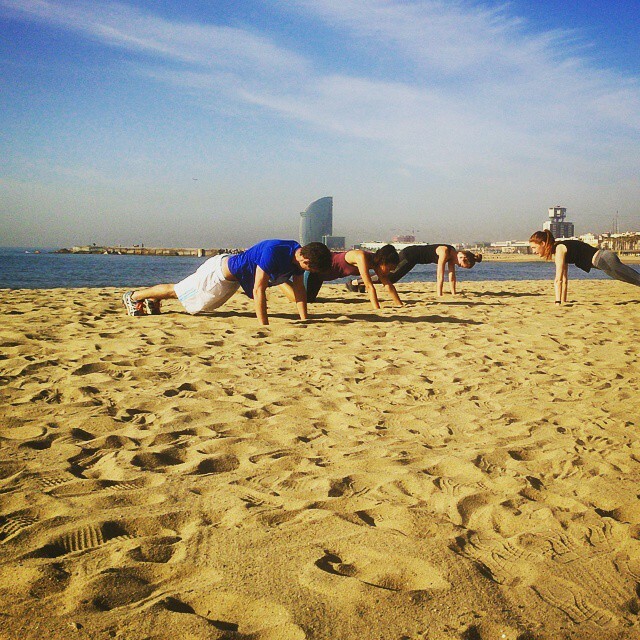 Hi, I’m Sarah, your Personal Trainer in Barcelona. I hold an EREPS approved Personal Trainer certification and I have specialized in functional training, bodyweight training, running, core strength, mobility and stretching. The sessions can be held in English, Spanish or Swedish. We train 1:1 (personal training) or in small groups and we train outdoors, at your place or at the studio that I share with some colleagues in the city centre. I aim to schedule at least 2 open group trainings per week but you can also create a closed group with your friends. For weekly details see my Facebook. and most of all, enjoy your body and have fun! I work with clients living in Barcelona and people who visit this amazing city, offering individual session where I show you the city while training. I can also help you to organize and enjoy training holidays in Barcelona, for private and corporate clients. You can read more about me and my qualifications here. Bootcamp & löpning i små grupper med svensk tränare i Barcelona! Jag har fått några förfrågningar angående gruppträning / bootcamps /löpning i små grupper (4-6 personer) som hålls på svenska (eller engelska) men vi skulle behöva bli några till för att kunna komma igång. Att träna i en mindre grupp är ett prisvänligare alternativ till privat PT men det innebär fortfarande personligt bemötande med individuell anpassning av övningar och nivåer. Det är också ett utmärkt sätt att lära känna nya vänner (eller en ny aktivitet med kompisgänget istället för att fika 😉 ). Jag är personlig tränare (med europeisk certifiering) med vidareutbildning inom funktionell träning och löpning. Breakfast for Champions! This is one of my favorite post-workout meals because it’s delicious, yet only takes 5 minutes to make. 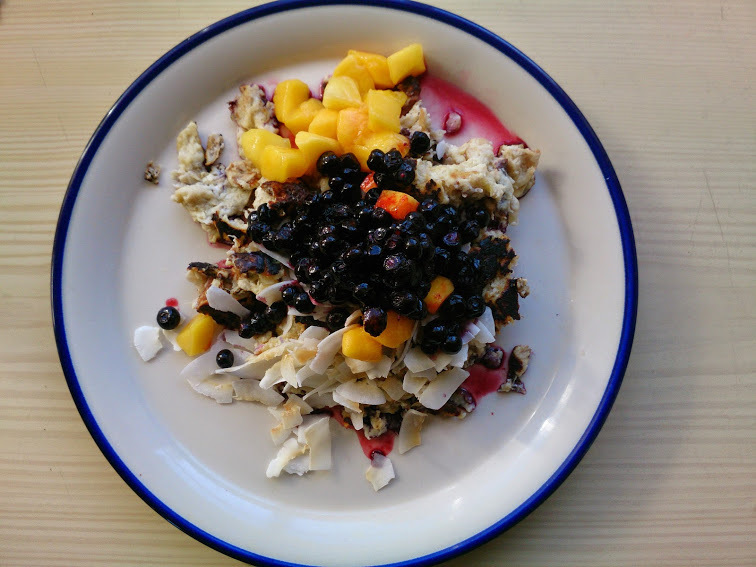 The lazy version of banana pancakes is nothing but scrambled banana eggs, here topped with coconut chips, mango and blueberries.For one hungry / hangry person mix 1 banana with 2 eggs, and scramble it in coconut oil. Eat it plain or with topping of your choise.